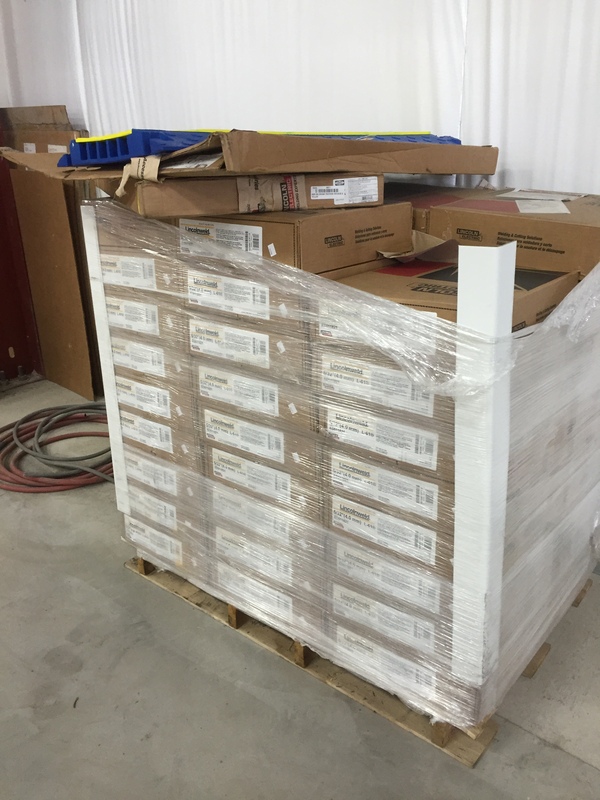 Proper storage of both opened and unopened packages of welding consumables is crucial. It should avoid quality issues such as porosity, excessive slag fluidity, rough weld surface, difficult slag removal and more importantly, elevated levels of diffusible hydrogen which can lead to cracking. 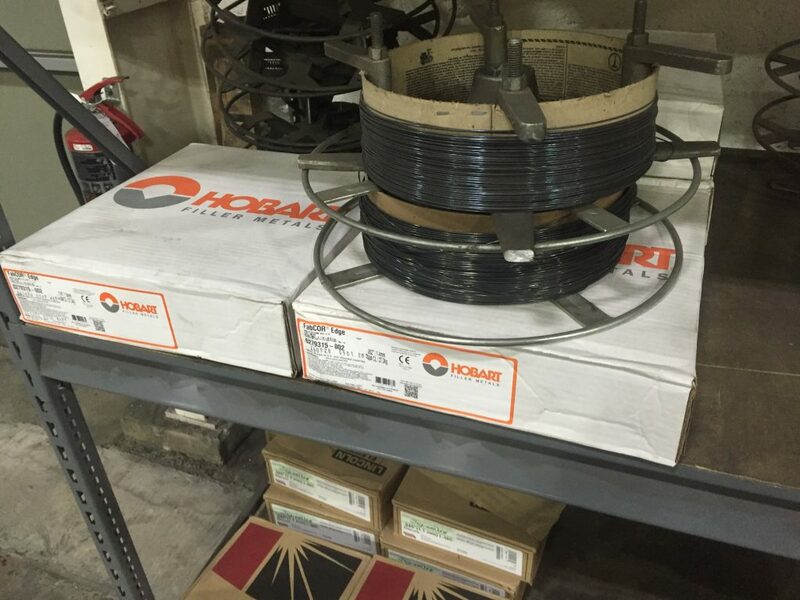 Welding consumables should be stored in their original unopened packaging in an area shielded from the elements. Adequate storage, handling and re-conditioning of electrodes vary according to type. The summary below provides guidelines as to the proper storage of stick electrodes, flux-cored wires, metal-cored wires, and solid wires (mig wire and tig cut length). These electrodes must be dry to perform adequately. Manufacturers typically supply these electrodes in hermetically sealed containers which provide proper protection under good storage conditions. Open containers of low hydrogen electrodes must be stored in a cabinet at 250F – 300F. Moisture resistant coatings (“R” designation) have higher resistance to moisture pick up, but should still be stored in the same manner. The “R” designation allows for more exposure time before the electrode needs to be re-dried. 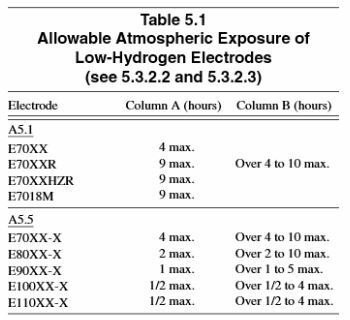 It is recommended that low hydrogen electrodes without the “R” designation be supplied twice per shift to stay below the permissible 4 hours of exposure. AWS D1.1 Structural Welding Code specifies allowable atmospheric exposure in Table 5.1 which can be seen below. Low hydrogen electrodes may be re-dried if they exceed exposure limits following the manufacturers recommended procedures. It is critical to avoid drying electrodes at temperatures above those recommended. Also, longer hold times at lower temperatures is not equivalent as holding the right temperature for the specified time. For additional information on storing and re-drying low-hydrogen electrodes read Storing and Re-drying Low Hydrogen Electrodes. If exposed to humid air for long periods of time the welding characteristics may be affected. If moisture appears to be causing problems it is recommended to store open containers in cabinets heated to 100F – 120F. Most manufacturers supply these electrodes in packages that provide proper protection when stored indoors with a relative humidity not higher than 70%. It is important to store in areas that minimize temperature variations to avoid condensation on the consumables. Store in its original, unopened packaging until it’s time to use. Protect from condensation and the elements (rain and snow). For applications in which the weld metal hydrogen must be kept under a specific amount (usually 8mL/100g H2 or lower) only use product supplied in hermetically sealed packaging. Discard any wire that has been exposed to moisture and shows signs of rust. Flux-cored wire should not be left out in the open when not in used as it is prone to moisture pick up. These electrodes are not as susceptible to moisture pick up, but should still be stored in similar fashion as the ones above. Store in unopened container until it is time to use. Store in areas protected from rain and snow, avoid severe fluctuations in temperature and protect from condensation. Discard if wire shows rust on its surface.